After a 33-year journey, Indonesia's very own legendary rock band Slank launched their latest album titled Palalopeyank on 7th February. The album, with 12 new songs by Bimbim (drummer), Kaka (vocalist), Ivanka (bassist) and Ridho (guitarist) was mixed and mastered by Steve Lillywhite — an English record producer who spent several decades as one of the most acclaimed and sought after producers in British pop music and whose portfolio includes work with The Rolling Stones, U2, Morrissey and Peter Gabriel, just to name a few. The band is known for its solid fan base in and out of Indonesia. As the band continued on, they're not losing old fans, but creating new ones. Record number 22 is a dedication to their guitarist, Abdee Negara, who was unable to participate in the recording process due to kidney failure. Slank frontman Bimbim, whose real name is Bimo Setiawan Almachzumi called that the recording process was "historically sad." Different than their previous releases, in Palalopeyank there are 11 fast-paced rock songs and one mellow song. Aside from the social issues, the album also talks about environment, Bali and there's also one track titled in Sasak (Lombok) language, Tampiasih (translation: gratitude) which talks about human trafficking, as Rolling Stone Indonesia points out. We're not inspired by the regional elections, but if there are songs that fit the current situation, it's just a coincidence." meanwhile, Slank's guitarist Ridho had infused new flavor into the album. 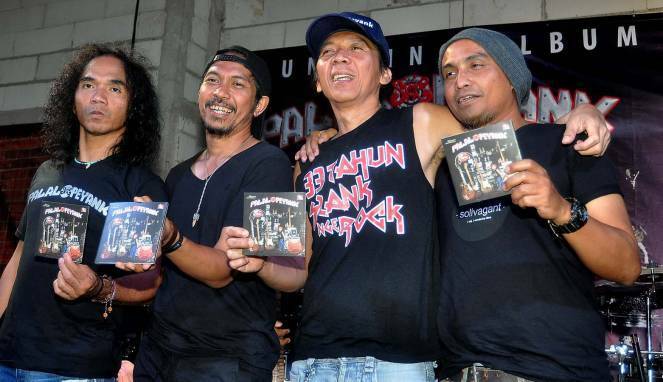 "I've always been a fan of AC/DC but Slank's past albums never have any of this style". One of the songs from the album, titled Terlalu Pahit is a collaboration with young Indonesian singer, WizzyWilliana. It was inspired from one of Slank's flagship songs Terlalu Manis from the Kampungan album released in 1991. Bimbim's third child, Maomettano Luke Almachzumi appears as a model on Palalopeyank's album cover wearing a headband and a Slank T-shirt. — as well as becoming the title for the 11th track of the album. Bimbim's little nephew, Andi Faliat also contributed to fill in the rhythm guitar on the 3rd track, Orang Merdeka. The photograph was taken by Ridho and Kaka designed the typography. For the album launch, the band will tour 22 cities across Indonesia. After Slank's religious album, D.O.A (2016), Palalopeyank marks their second collaboration with Jagonya Musik & Sports Indonesia (JMSI) as the distributor. The physical release of the album is available for purchase in KFC outlets for Rp 44,000 (S$5), while the digital version will be available through various streaming services such as iTunes, Spotify and Langitmusik.